Singapore for this event. Not only did I leave the event being more informed about design developments in Singapore, it was also heart warming to converse with the panelist on a personal level. 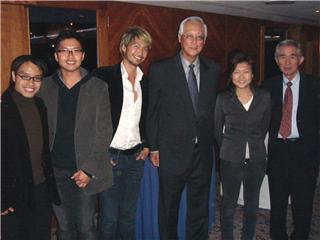 The panel consisted of key Singapore architects, Senior Minister Goh Chok Tong – although not an architect by training but he was influential in leading and 'designing' Singapore in the nineties – Mr Liu Thai Ker, ex-Chief Planner in URA; and very prominent British architects, which included Jack Pringle who was chairing the discussion, Graham Cartledge and Michael Wilford who played a pivotal role in Singapore's architectural scene, such as the realisation of our Esplanade. opinions and Jack Pringle had to make the difficult decision in ending the discussion even though there were several participants wanting to post their questions. 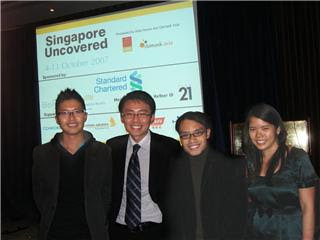 After the discussion, dinner was fabulous, not only because of the delicious Singaporean food, but also the opportunity in interacting with other participants and especially SM Goh and Mr Liu, who shared their vision and thoughts on our design culture and society on a very personal level. Indeed, the panel discussion was intellectually stimulating and I believe each of us took home another perspective of Singapore's architectural development.